Bedard, 32, has a 3.45 ERA, 8.6 K/9, 3.0 BB/9, 1.08 HR/9, and 41.7% groundball rate in 91 1/3 innings this year. That's his highest innings total since '07, as he endured multiple shoulder surgeries. With Daisuke Matsuzaka out for the season, Clay Buchholz battling back problems, and Jon Lester missing time this month with a strained shoulder muscle, the Sox will take whatever they can get from Bedard. Bedard recently returned from a month-long layoff due to a knee sprain. He's owed only $324K in additional base salary, but can make millions more in incentives. In Robinson, the Mariners came away with the best prospect in the deal. The 23-year-old outfielder is hitting .293/.375/.563 at Triple-A. Baseball America ranked him tenth among Dodgers prospects heading into the season, saying he's "loaded with athleticism" and "could have four average or better tools." Chiang, signed by the Red Sox out of Taiwan in 2006, has a breakout .338/.399/.647 line at Double-A. The Mariners added two quality outfield prospects without giving up much. The Ms did have to surrender Josh Fields, their first-round draft pick from 2008. The 25-year-old has experienced control problems in the high minors. 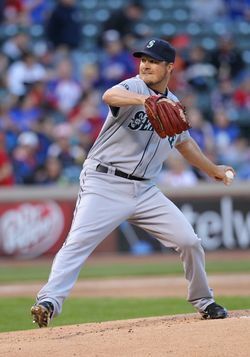 Baseball America ranked him 24th among Mariners prospects prior to the season, writing, "he could be a useful middle reliever if he can tighten up his control." Federowicz, a 23-year-old Double-A catcher, must have been the key to the deal for the Dodgers. He's a well-regarded defensive backstop, but has a .275/.337/.397 line at Double-A. Overall Dodgers' involvement is a bit of a head-scratcher, but we'll see if prospect experts agree. Rodriguez, 22, has a 5.19 ERA with 13.4 K/9 and 4.9 BB/9 in 59 innings of relief at Class A this year. In parts of four professional seasons, he has a 3.31 ERA with 10.8 K/9 and 4.6 BB/9. Fife, 24, has spent the past two seasons in the rotation of Boston's Double-A affiliate at Portland. He has a 3.66 ERA with 6.1 K/9 and 3.2 BB/9 in 103 1/3 innings this year. Jon Heyman, Gordon Edes, and Jon Heyman broke the story with ESPN.com's Buster Olney reporting the specifics of the trade. Photo courtesy Icon SMI.